It could be any day of the year, but it just makes it easier to accept random people giving away unexpected gifts to strangers, especially dressed like that. And as one put it aptly at the end of event, it helps overcome our own hesitancy, push away doubts and just do it. The spirit of a festival affects us all, shoving everyday troubles away to be dealt another day. And instead, offers a chance to magically brighten our living, even on a cold day in December, celebrated as a symbol for all that is. Alike 50-60 who made it happen (and others contributing only monetary wise), a chance to spread smiles among those who meet in our everyday living instead of yet another NGO/School gift distribution was compelling. And so, last Thursday, four teams started from Silk Board, Jayadeva Hospital, Tin factory and Yeswanthpur circle - 8 AM and thereabouts. 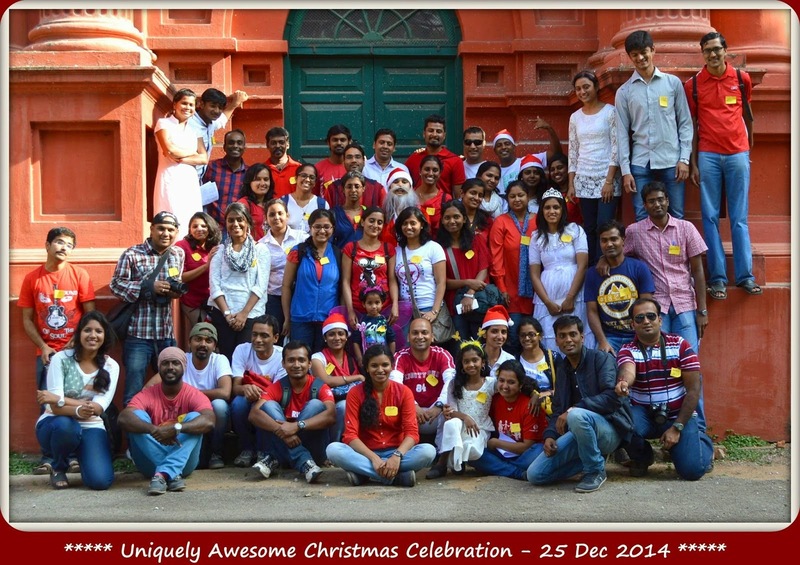 All teams were then to converge to Cubbon Park to unite and revel in our day's experience. Group C (the Sportive and Supportive team as it got labeled later) led by Gaurav (and supported by Hiren, Kamalesh) got us going with an outline of things to come. That was after we signed our attendance and pinned a self written badge (to identify ourselves, but I feel it served as a better identification amongst strangers that we were doing some team activity). Tasks were spelled out and readily we all raised our hands to carry them out. We then moved to Gopalan mall for breakfast (for some) in car and four motorcycles. While waiting, Kamalesh, Ashish and Nadhiya carried out the first gifting - an elderly lady sweeper. The genuine joy on her face set the stage for our own experience too. And just before we were leaving, 6 kids added more color to the event - though a little spoiled by teens resorting to sneers and snides. Gaurav and team had already prepared us for this eventuality and we kept cool :) Apart from pre-wrapped gifts, we were also distributing toffees, biscuits and cup cakes and had money to buy food/drink - over the day it mostly involved fruits like banana, apple, orange and coconut water. Learning on the go, we split the gifts into three bags (*, **, *** according to different age groups instead of boys/girls). Our next stop - near the Bypanahalli Metro Station. A large family selling various wares had bunch of kids - the smile and reaction to gifts and food items was overwhelming. Being early in the day or what, we didn't meet any candidates at traffic signals. So, at Indiranagar Double road, we left Old Madras Road and decided to take CMH road. We treated a footwear mender and garbage collector. But still, plenty of goodies were left in our kitty. Murphy's law again to the fore. Just past Ulsoor metro station, we spotted kids amongst construction workers. More smiles and joy, but a scared and crying kid too (later, other teams too revealed such incidents). And one sly fellow demanded and got a bat (which wasn't wrapped around the handle and thus spotted). All in all, the kids, their parents and us were all happier for the gifts received and given. Onto MG road next. Just before Brigade road, spotted an old man struggling to walk - white plaster around a heel, asking around where to board a bus to Shivaji Nagar. We gave him cupcake (and biscuit pack which he refused) and brought him tender coconut. The six ladies in our group then decided for a walk through Brigade road in search of needy (and call us if needed). Gaurav had an inspiration and along with Ashish carried it out - toffee and cupcake to a traffic cop :) Shortly after, myself and Ashish were called for service. The ladies were talking to a very old man selling ground nuts - got two packs from him and gave cup cakes. The very long walk thereafter to Residency road and doubling back to MG road wasn't fruitful in terms of gifting. Meanwhile, others had got packs of cotton candy which we devoured before heading to final gifting location - Shivaji Nagar bus stand and neighborhood. The vibrant festival holiday mood was at peak here - so much hustle and bustle of crowd and hawkers alike and congestion so heavy that one couldn't walk more than two paces freely at a time. So, here it was that we managed to empty most of our hoarding, more smiles we saw, albeit amidst a tad uncomfortable surrounding of human congregation. And our elderly man with plaster was there too - must have got the bus without problems after all. A light meal/juice at bus stand (too crowded here too) later, we headed to Cubbon park. More walking and a bit of confusion later, we finally gave rest to our tired frames and joined one another group near the museum. We greeted others whom we knew from previous treks, almost everyone was mingled - a big BTC family. A while later, the other two groups also arrived, almost simultaneously from opposite directions. Ajita (overall organizer) got us quickly assembled (straight circle as the BTC joke goes) to conduct intro and feedback rolled together. As we were too many members, it took such a long time that Canteen wala got irritated as his customers found it difficult to find seats. We moved away (in our enthusiasm, we had quite overlooked our immediate surroundings) and formed quickly again to continue. People brought forth many positives and spark gleamed in their eyes as they reminisced the smiles and joy they had brought about. Photo session (as separate groups as well as one big group) was followed by accounting and good byes to meet again to enrich ourselves as well the community we served. Sreeraj dropped me back home to end one of the best social events I have been part of.